I love Portland, Oregon. The people are nice; public transport is pretty good; and the scenery is gorgeous. Some call it Bridgetown–the Willamette River bisects the city–others say it’s the city of roses, referring to the International Rose Test Garden found in Washington Park. However you term Portland, one thing you need to know is that the food is outstanding. Although Portland isn’t known for one type of cuisine (although locals may tell you it’s a sandwich city all the way), “fresh” and “local” are words that appear on many a menu in this town. I’m going to take you through the food MDP and I sampled on our trip to Portland. You might want to get a snack before you dive in–this post is certain to make you hungry. While doing thorough research on which restaurants to try in Portland, I came across Bunk Bar Water. 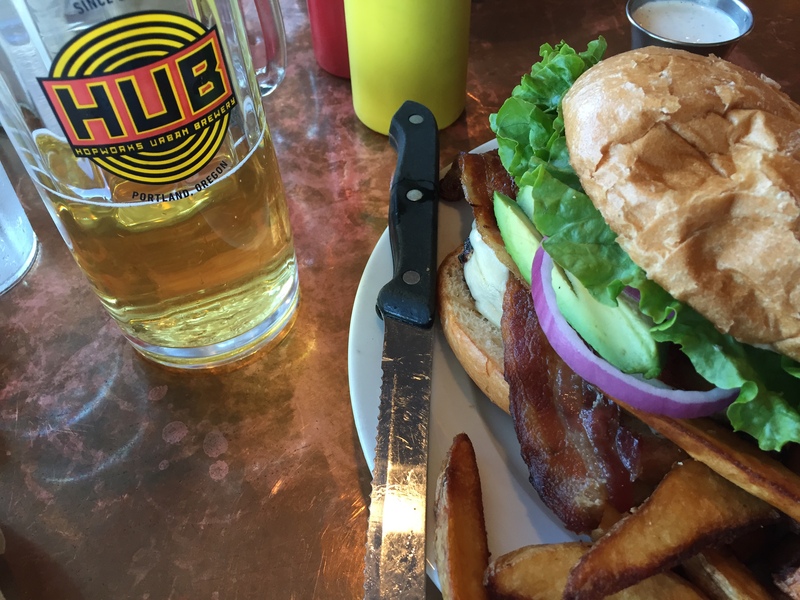 I thought this would be a good place to experience a Portland sandwich, and boy was I right. We went to the place straight from the airport, with our suitcases in tow, and the gentleman behind the bar promptly asked, “Did you get kicked out?” Given the number of vagrants milling about the city, this kind of question wasn’t all that strange. After I smiled and told him that we were visiting from out of town, he took our order and we picked a booth to sit in. A few minutes later, our grilled cheese and tomato soup and pulled pork sandwich arrived. 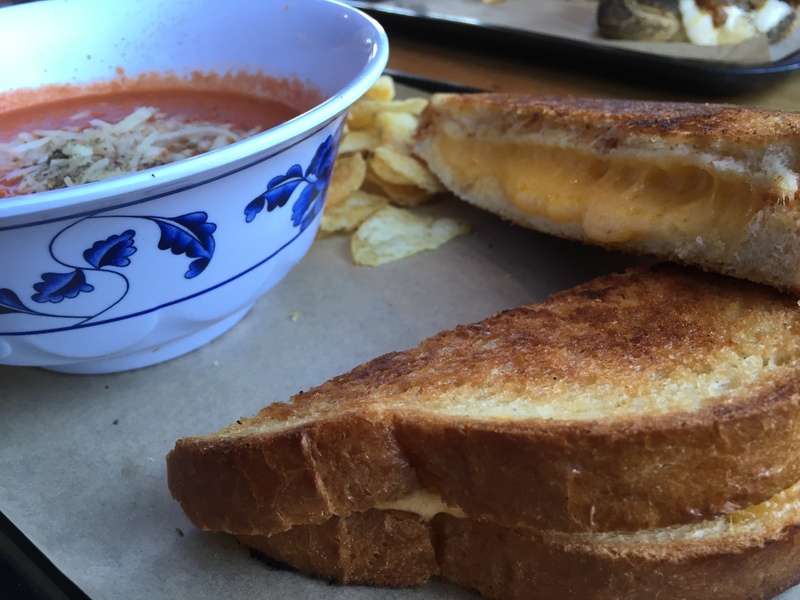 The grilled cheese was made with locally sourced Tillamook cheddar that was melted between two of the best slices of bread I’ve ever had. They were flaky and buttery and extremely delicious. MDP’s pulled pork sandwich was topped with coleslaw and sat upon a light and airy poppyseed bun. I highly recommend! A word on service in Portland: It’s nothing like New York. Often, you seat yourself (which is fine!). The servers are generally very friendly and kind, but very slow and laid-back. Of course, not every restaurant is this way, but there seems to be a lack of urgency steeped deep in their culture that undoubtedly finds its way into their service. 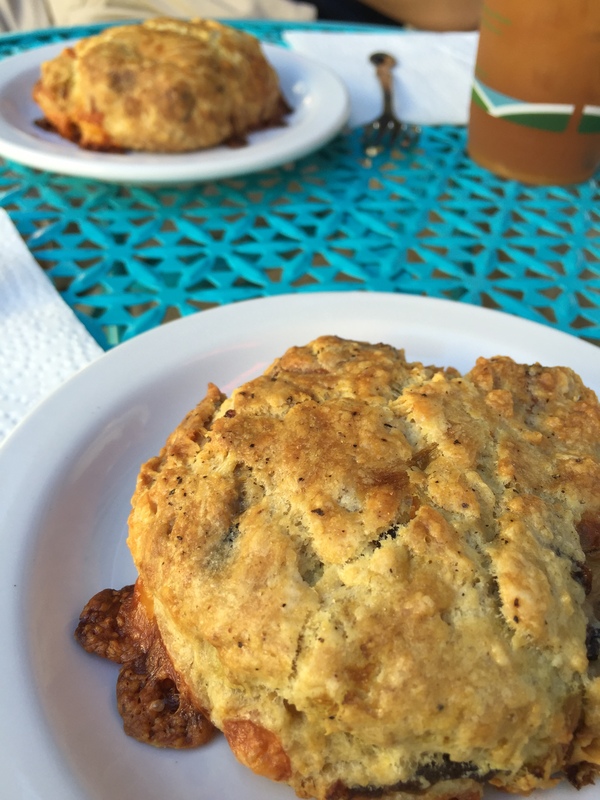 As previously mentioned, Portland isn’t necessarily known for a particular cuisine, yet I had the opportunity to sample Southern cooking all around town. Screen Door was one of the best. And it seems the word has gotten out: the cozy place typically has a line snaking around the restaurant and down the road at 8 am on Saturdays (!). It’s that good. A lovely waitress came over to us with a water pitcher and a coffee urn, and poured us some drinks straight away. 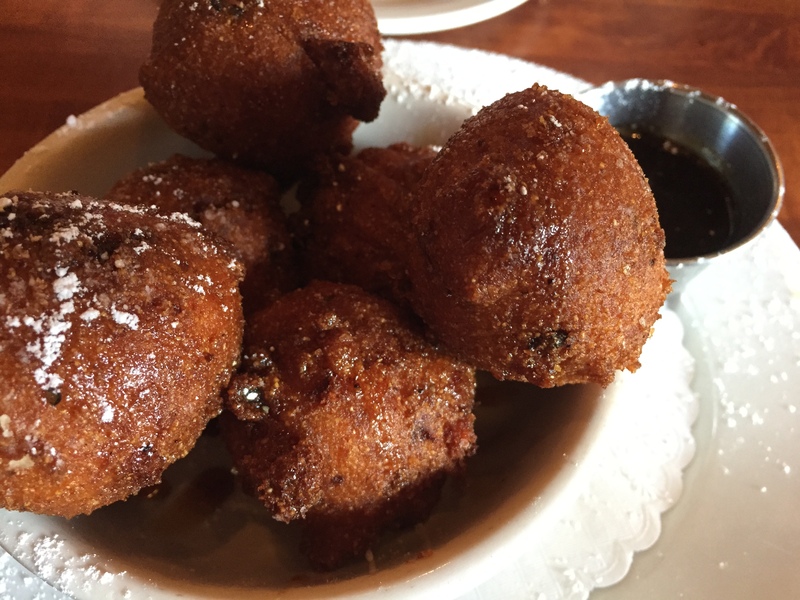 We started with the glazed breakfast hushpuppies, which were outstanding. Lightly fried, the corn balls had thick chunks of phenomenal bacon and smoked cheddar on the inside, with a side of creole cane syrup that was the perfect accompaniment to the hushpuppies. I ordered the biscuits and gravy with scrambled eggs as my breakfast entree, while MDP got the buttermilk biscuit sliders with cheddar grits on the side. Both dishes were amazing. The biscuits achieved the ideal: simultaneously light and dense, with a fine texture, like the surface of the moon. I enjoyed the gravy for its delicately spiced flavoring. It wasn’t heavy-handed, as many other white gravys can be. This place is a must, if you’re visiting the city. You know I hate Yelp. This place perfectly illustrates why. On Yelp, it has 4.5 stars–that’s out of five, as I’ve rated restaurants here. La Cocina serves up some of the worst Mexican food I’ve ever had. 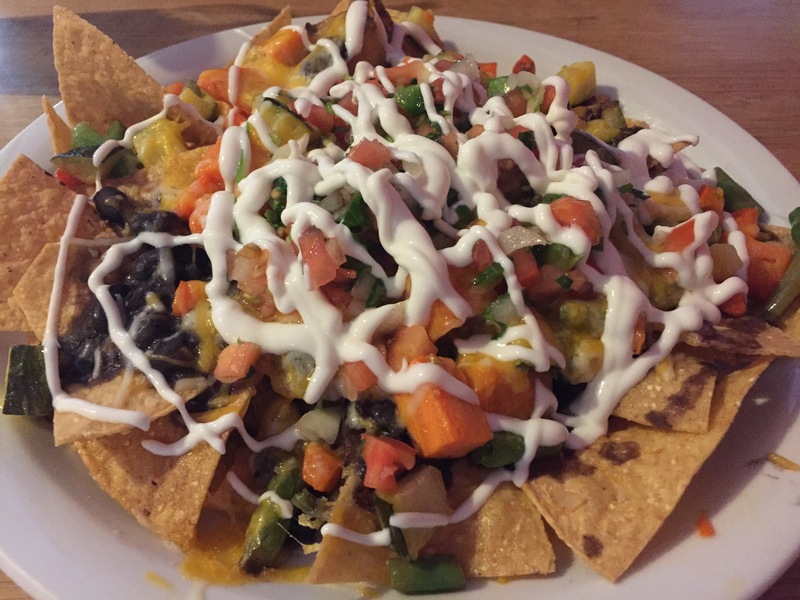 Although the photo of nachos I’ve included here may look decent to you, they were just okay. I was optimistic after we finished these nachos, thinking that our entrees (fajitas and a burrito) would be better. Well, they weren’t. The steak fajitas were made with subpar meat, and, while they gave me many tortillas in a cute little tortilla holder, there wasn’t any sour cream, pico de gallo, or guacamole presented to me. The beans and rice are hardly worth noting, if only to caution you to never get them. MDP seemed to like his burrito, which was covered with a mole sauce, certainly to mask the flavor of the carnitas within. If you are accustomed to the nuanced flavors offered by Mexican restaurants such as De Mole in NYC, don’t even bother trying such cuisine in Portland. You’re certain to be disappointed. 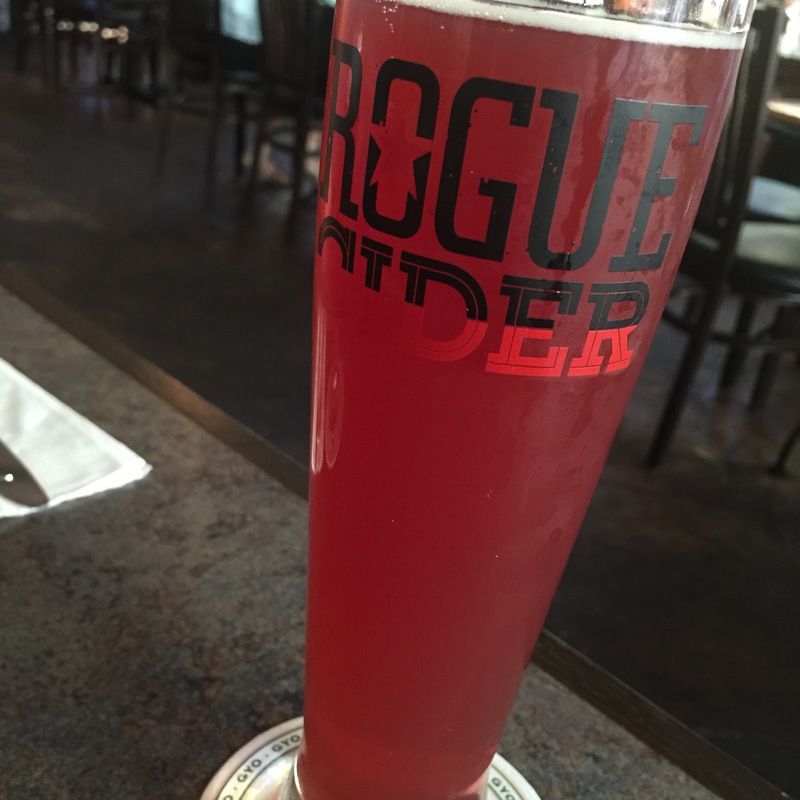 Rogue Distillery & Public House, in the Pearl district, offers an array of draft beers and ciders exclusively crafted by Rogue, the brewing company. MDP got a Shan-Tea, which is like a shandy but made with iced tea, instead of lemonade, and Rogue’s very own Dead Guy Ale. I tried the fruit salad cider, which was a bit too fruit-forward for me, but I appreciated the effort. This location also serves food that is decent, so it’s well worth a stop. It’s hard for me to assess whether Tasty n Alder or Irving Street Kitchen (later in this post) has better food. They’re both outstanding restaurants. Tasty n Alder has a New York feel: it has the modern clean aesthetic and serves up small plates. We began our culinary journey with the chocolate potato doughnut with creme anglaise–very good. Next, they brought us the Korean fried chicken, which came with short-grain rice, kimchi, pickled cucumbers, a sunny-side up egg on top, and a boiled egg chopped up and sprinkled around the dish. This was fantastic–the chicken was drenched in a gochujang sauce to spice it up and I adored the pickled cucumbers (although MDP wasn’t crazy about the kimchi). Then, they brought us the fried egg and cheddar biscuit with house made bacon–fantastic!! I thought this was the best part of the meal. 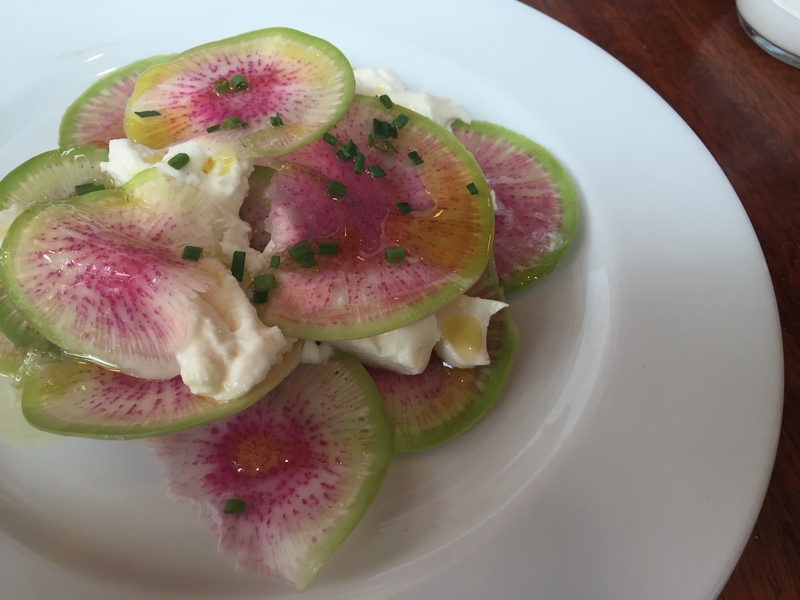 We also sampled the burrata with watermelon radishes, which was too pretty, too rare, and too delicious to not show you. “Sure, you can go to Voodoo Doughnut if you want Fruit Loops on your doughnut,” commented one of our waitresses in Portland. We had mentioned that we were thinking about going to the much-heralded tourist trap of a bakery, and she wasn’t impressed. Now I understand why. We waited for about 30 minutes under the surprisingly hot sun. 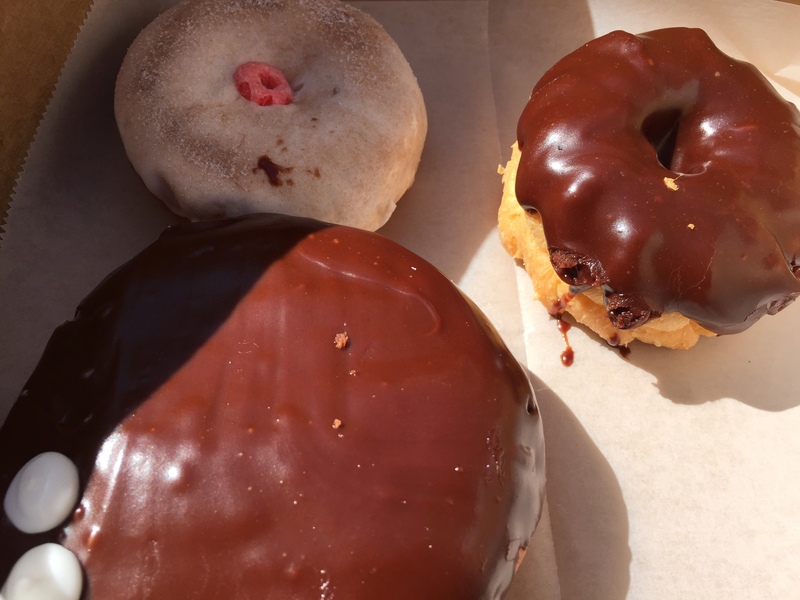 When we got to the front of the line, I quickly decided I’d get a french cruller with chocolate icing. MDP wanted the Arnold Palmer doughnut, and I thought we’d throw in the Portland Cream for good measure. They were all so incredibly sweet that I wanted to throw up for, like, five hours after I tried them. (No, I didn’t eat all of the doughnuts myself!) MDP seemed to enjoy them, and maybe you would, too, but I wouldn’t recommend this place: it’s not that cool and the doughnuts, old-style as they may be, are not the best I’ve ever had. If you happen to travel east to the Columbia Gorge, keep going until you get to Hood River and then stop in at the Full Sail Brewing Company. 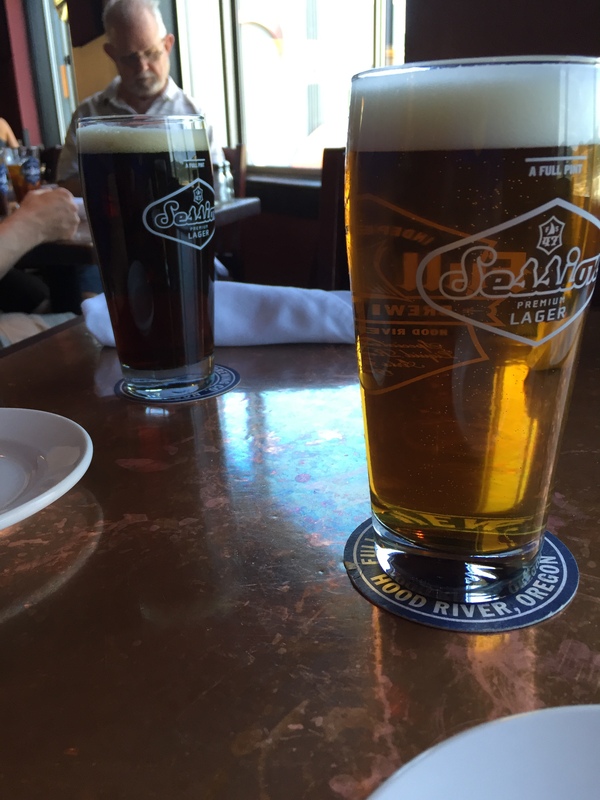 Take a tour of their facility–which seems impressive!–or head straight to the pub for an appetizer or two and a couple of authentic Oregon brews. Their main offerings are Session beers, which I’ve had on the East Coast if you can believe it. I enjoyed the one I had, whose style escapes me, and MDP liked his. We also got the spinach and artichoke dip that actually came with more pita than we needed–a rare situation. And, if it’s a beautiful day, you’ll be able to watch the kite surfers do their thing on the expansive Columbia River. It’s well worth a visit! This small, family-owned coffee shop across the street from Portland State University serves Stumptown coffee, which is some of the best you can get. In addition to the outstandingly smooth latte I ordered, we got some biscuits for breakfast. They were crumbly and filled with delicious cheeses and vegetables (and bacon, in one instance). If you visit Portland, try to find a hotel that’s centrally located, such as in the downtown area where Contrary is found. A note on Portland food trucks: Food trucks, or food stands really since they’re not on wheels, are very popular in the city. But, based on my experience, I wouldn’t “waste” a meal at one of them unless you’re desperate for food or you’ve run out of money. We went to a handful, including one of the supposed best, and I wasn’t impressed at all. The food trucks outside my work building in midtown are far better, in fact. Wow is this place outstanding. Maybe I liked it because it reminds me of New York. Or maybe it’s just because the food is so damn good. Either way, Irving Street Kitchen offers some of the best food I’ve ever had. We started the meal with local wines and a cheese plate. First of all, the cheeses–a blue cheese and a cheddar–were completely delicious. As if the cheeses themselves weren’t the best ever, the chef went a step further, putting house made crackers that boasted a nuanced flavor and delicately crafted jams on the side. Amazing! A server also brought over some of the best bread ever, from Ken’s Bakery in Portland. Wow! For entrees, MDP got the fried chicken while I ordered the marinated hanger steak. The chicken was good, but not as flavorful as others I’ve had. But the steak–it was so tender and juicy. 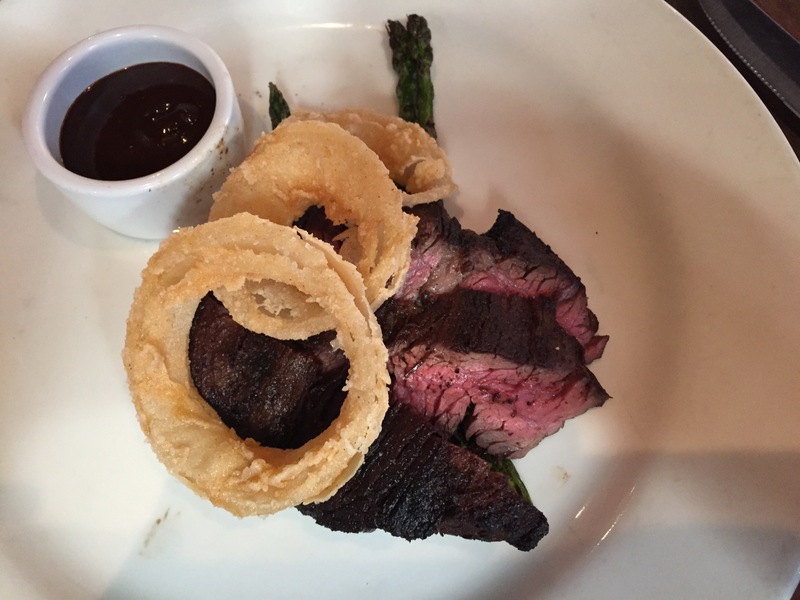 The asparagus that lay underneath the meat was thin and crisp, and the few onion rings they provided were fantastic. We didn’t stop there. We also ordered the chocolate cherry tart with matcha ice cream (not my favorite) and chocolate cherry curd. The curd stole the show in this dish–so creamy and rich with flavor. You’ll have to go here if you ever visit Portland. But make a reservation, if you can. They only have a few tables set aside for walk-ins. Portland has some of the best food I’ve ever had outside of New York. Much better than San Francisco, in fact! It’s a beautiful city with a lot to offer and I hope you visit some time.